One of the easiest ways for your company to receive free media exposure (often known as "earned media") is through media events. 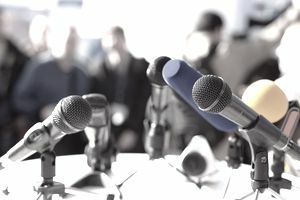 Whether you're teaming up with several sponsors to help the less fortunate, or holding a press conference to announce a product release, there are certain steps you should follow to organize a successful media event. Sending out your press release will help the media decide if your story is worthy enough of coverage. That's why it helps to keep your press release simple and never use any hype. Stations and newspapers are looking for news; they're not looking for a sales spiel. You've got a window for sending out your press release. You don't want to send it out too early and then it gets forgotten or buried, and you don't want to send it out too late when other stories may have already been assigned, and they simply can't fit your event in. Generally, 2 to 3 days before your event is enough advance notice. You also want to be sure you include directions and any special instructions within your press release. If your company's headquarters are at one location, but your event is at your plant 30 miles away, you need to make this clear in your release. After you've sent your press release, you can call the editors at the newspapers or the producers at the TV stations to verify they receive it. That's all you have to ask. It will often open up the conversation for them to tell you if they think they'll be able to come or not. But even if it doesn't, you don't want to ask if they're coming. They'll be there if they can but won't make any promises. Do keep in mind, breaking news or heavy news days might prevent them from coming at the last minute. You don't want to pester them to see if they're coming, even on the day of the event when you're standing there waiting for reporters to show up. You also want to watch the time you make your phone call. Calling at 10 minutes before 5 p.m. might seem like the end of the day for you, but for a producer that's 10 minutes until a nightly newscast. The best times to call are generally around 10 a.m., and between 1 and 2:30 p.m.
Everyone's working on deadlines. Newspapers have set times they put the next day's issue to bed. It means if they come to your event at 5 p.m. on Thursday, coverage may not show up until Saturday. TV stations generally have a morning, noon, 5, 6, 10 and/or 11 p.m. newscasts during the week, depending on your TV market. Getting coverage if your media event starts at 4 p.m. might be very tricky. They won't just hop into their news car and drive like crazy to get your tape on the air by 5. There's a script that has to be written and a tape that has to be edited. Plan your event time so that it's not only convenient to the reporters but also increases your chances of getting more immediate exposure. As tempting as it may be to become a director, don't tell the reporter, photographers or videographers what shots you want them to get. You want to establish a certain rapport with them and start a relationship with the newspaper or TV station. You won't win any friends by telling them how to do their job. If you're holding the event at your 50,000 square foot plant and the area you're allowing media is in the back of the building, give them as easy access as possible. Don't have them park at the front of the building and then lug their equipment all the way to the back if you can help it. If there's a way to drive to the back, let the media know the driving directions in your press release and clearly mark the way when they arrive. You also want to consider what area of your facility is strictly off-limits. For example, if you can't avoid a long walk, do you really want the media to walk through your entire building with cameras? That doesn't mean they're going to start shooting whatever they want. But many companies have strict policies about where cameras and non-employees can go for proprietary reasons. Think about your visuals carefully. Give the media as much of a hands-on experience as possible. Talking about a product for half an hour and then referring to the picture in the brochure is something the media doesn't even have to show up for. Remember, they're passing the visuals on to your potential customers (their viewers or readers), so it's important to keep your audience in mind so you can get the coverage you need. Include the information about your event and hand it out to the media. This info will help them write the story but also helps you have more control over the news since you're supplying them with the crucial info. Don't forget to make your media contact available for questions. If a reporter has additional questions, they need to be able to get a hold of your media contact quickly. Be sure to include the media contact's phone number and any other contact info within your press kit. You don't have to limit your event's spokespeople to your own media contact. If an employee can give a better soundbite because he's had more experience developing and working with a certain product, by all means, make him available for questions. If you do plan on talking on-camera or to a newspaper reporter, think about what you want to say ahead of time. It can help to have a friend who's not familiar with your business to read over your press kit and ask questions they have. From these questions as well as some brainstorming of your own, come up with a list of answers. You don't want to sound rehearsed, but you don't want to sound unprepared or saying "Umm..." a lot either. You also want to consider the different types of mediums. The newspaper has different needs than television and vice versa. A newspaper reporter might ask you questions that are much different than a TV reporter. Each medium has different ways of presenting your news so they'll need the type of that suits their audience the best. What If the Reporter Doesn't Show? The station or newspaper may very well send a photographer or videographer instead of a reporter. That doesn't mean your story isn't important to them. They wouldn't be there if they didn't plan on giving your story coverage so treat whoever shows up very well. If a videographer is lugging his gear, don't hand him a press kit right then. Offer to carry it for him until he's been able to get the shots he needs. Treating him or her like a second-class citizen will make it back to the station and could hurt your chances of future coverage.